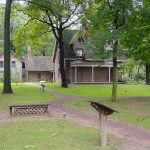 In 1752, Lewis asked his brother-in-law and good friend, George Washington, to survey 861 acres, the core of a 1,322-acre plantation just outside Fredericksburg, which would become Kenmore. Lewis then bought the tract and began a career as a planter, which would enable him to sell his own produce. His slaves would soon number more than 80. They and their white overseers planted the area’s staples: corn, wheat and tobacco. In 1769, Fielding and Betty started construction of a large Georgian mansion at Kenmore, where he and Betty could raise their large family. But the rift over taxes placed on the colonies led to postponements and delays in their house plans, since such items as paint, glass and hardware came from England. The house would not be completed until 1775. In 1772, George Washington purchased a house from Michael Robinson in Fredericksburg, Virginia for his mother. Mary Ball Washington spent her last seventeen years in this comfortable home. The white frame house sits on the corner of Charles and Lewis Streets and was in walking distance to Kenmore, home of Mary’s daughter Betty Fielding Lewis. In March 1773, Fielding Lewis joined Virginia’s Committee of Correspondence, the first of several Colonial committees that gathered intelligence from British sources. In 1775, the Lewis family finally moved into the new Georgian-style brick mansion at Kenmore – two stories, eight rooms, about 4,700 square feet plus a full cellar. In the spacious interior, the plaster designs on the 12-foot-high ceilings combine baroque, neoclassical and rococo elements, and the exterior of 317,000 bricks is pristine. Many people lived and worked on the plantation, including the Lewises, 4 of their 8 surviving children and over 80 slaves. The house was built by skilled tradesmen, indentured servants and enslaved African Americans. In Tidewater Virginia, homes like Kenmore were not unusual but most of the homes of its type were destroyed in the Civil War. Unfortunately, the family almost immediately entered a period of financial difficulty because of the War. Fielding Lewis was in charge of the militia in Spotsylvania County with the rank of colonel, and provided saltpeter, sulphur, powder and lead for the manufacture of ammunition. He also supplied salt, flour, bacon and clothing from his store in Fredericksburg to the soldiers, and later provided for them when they were wounded. Colonel Lewis also made great sacrifices to aid his brother-in-law and friend, George Washington. In June 1775, after Congress appointed Washington commander in chief of the Continental Army, Lewis was appointed to establish and equip a factory to make small arms for the colony in Fredericksburg, the first such factory in America. Virginia’s third revolutionary convention contributed the first 25,000 pounds, but most of the operating funds came from Colonel Lewis. His first letter to Washington about “our little manufactory,” dated February 1776, said they had “been mostly repairing old guns,” but expected production of muskets to begin in March, with a ten-gun-a-day quota. Unfortunately, the patriotic zeal which distinguished Colonel Lewis also ruined him financially. He advanced increasingly large sums from his personal account for the expenses of the Fredericksburg Gunnery as well as for outfitting ships. Kenmore was heavily mortgaged to meet the costs of all these patriotic enterprises. He also lost a great deal of money during the war because he was not able to carry on his mercantile business. By this time, Lewis’ health was failing, probably because of a respiratory ailment. He claimed that the commonwealth of Virginia owed him about 35,000 pounds, equivalent to more than $2 million today. “I have destroyed myself greatly,” Lewis wrote to Colonel George Brooke, treasurer of Virginia, in February 1781. Fielding Lewis died in December 1781, just two months after the defeat of Cornwallis at Yorktown. At the time of of his death, he was still owed £7000 but it was never repaid. 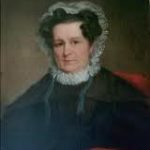 As a widow with four minor children, Betty Washington Lewis remained at Kenmore for another fourteen years although the property was inherited by Fielding’s oldest son John. She struggled financially and at times resorted to renting out some of her slaves. She tried running a small boarding school at Kenmore, but again money had to be raised and piece after piece of the land was sold to obtain it. Also, her brother Samuel Washington’s orphaned sixteen-year-old daughter Harriot Washington lived with Betty from 1792 until 1796 when she married Andrew Parks, a merchant in Fredericksburg. George Washington was her guardian upon the death of her father. During the last two years of her life, Betty lived at Mill Brook, a smaller farm about twelve miles south of Fredericksburg along the Po River. In many ways, the property suited her more than Kenmore because it had better farm land and a mill that generated a small but steady income. Betty Washington Lewis died March 31, 1797, at age 64, while visiting her daughter, Betty Lewis Carter, at the Western View Plantation in Culpeper County, Virginia, and is buried there. Betty and her husband are commemorated with street names in the Ferry Farm subdivision – Fielding Circle and Betty Lewis Drive. Despite postwar appeals by friends to the House of Delegates and Governor Patrick Henry, the Lewis family was never compensated for Fielding’s enormous advances of energy and money in the cause of the American Revolution. The Lewis children, in need of money, sold Kenmore in 1797. After many changes of ownership and divisions of acreage, Kenmore was slated for destruction or division into apartments in 1921. But Fredericksburg’s Vivian Minor Fleming decided that Kenmore had to be saved. In 1925, the Kenmore Association (now the George Washington Foundation) bought the property for $30,000. In 1970, the National Park Service designated Kenmore as a National Historic Landmark.